While they may seem like unnecessary extra equipment, a pressure washer is, in fact, one of the most valuable cleaning tools you can have for your home. A pressure washer is an easy and safe way to always keep your home and everything in it in impeccable condition. The pressure washer has various uses in and outside of the home. Some of its more obvious uses include giving interior and exterior walls a thorough cleaning. However, the pressure washer’s utility stretches far beyond that. You can use your pressure washer for cleaning a wide variety of surfaces, including your driveway, patio, garage doors, outdoor furniture and barbecues, fences, and can even be used on your car or other miscellaneous objects like boats, motorcycles and plenty more. These powerful cleaning tools use a simple mechanism to provide deep cleaning results. Using an electric motor, water is released at such a high pressure that it effectively blasts away dirt and grime build up that would have been otherwise impossible to get rid of. It is thanks to this deep cleaning results that have made the pressure an indispensable tool for any homeowner. Below you’ll find some of the most highly rated pressure washers available on the market. 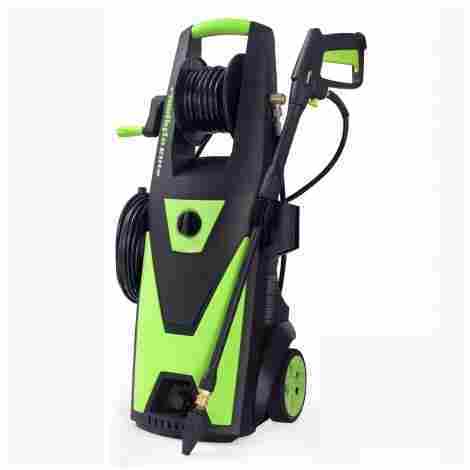 This product is one of the most powerful pressure washers available on the market. This gas-powered option delivers up to 3200 PSI at 2.5 GPM which makes this the perfect tool for someone looking to get rid of immensely stubborn dirt and grime. Despite its bulky size, the MSH3125-S is surprisingly easy to use and durable, making it a great choice for home and business owners alike. Itincludes a Honda GC190 engine that ensures a powerful deep clean of any surface. This device can blast away years of dirt and grime build up in a few seconds to reveal a sparkling clean surface. This is the perfect choice for heavy-duty or industrial cleaning. The entire device has been manufactured with only high quality, and durable materials to withstand any element. The included hose features anti-abrasion and anti-kink technology to ensure longevity while the wheels on the device are strong enough to easily glide over any surface. This is one of the more expensive pressure washers on the market but is definitely worth the investment. This device's unique durability will make sure that you can use it for years to come. This is a great all-rounder cleaning device that delivers both on power and versatility. This electric washer can deliver up to 2030 PSI with ease to easily get rid of even stubborn dirt and grime build up. Every device comes with several nozzles and other attachments which you can easily put on and remove again to create a customized cleaning experience. The Snow Joe can easily deliver a variety of pressures to effectively clean any surface. You can adjust the pressure and choose between a variety of attached nozzles to effectively clean any surface in and around your home. It features innovative design in its dual tank system. This allows you to use two separate detergents in a single wash. Simply fill the two 0.9 litre tanks with your desired detergents and easily switch between the two as you clean. Despite its low cost, this product is surprisingly durable and powerful. This is a great option for the novice or casual cleaner who needs a simple cleaning tool. In addition, every model comes with a variety of attachments which means no unnecessary added purchases. This pressure washer is the ideal option for the casual cleaner who needs a reliable, albeit less powerful cleaner. This device was designed with the user in mind and is very easy to set up and start using. The pressure washer comes with a variety of nozzles for versatile washing. The device also features a soap applicator to make cleaning quick and easy. This product is much more compact and light than its counterparts. The ergonomic design makes it ideal for people who don't necessarily have the capacity to deal with heavy and bulky machines. The device is easy to move around and can easily clean up your surfaces. The device has been designed with the novice or casual user in mind. Assembly and starting up your device is very easy. In addition, the devices operate much more smoothly and are less noisy than the average pressure washer. 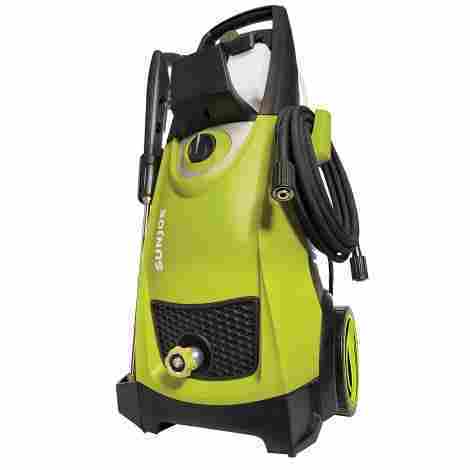 The Greenworks 1500 is one of the most affordable pressure washers on the market. It comes with three different nozzles as well as a hose and soap applicator which means that you won't need to purchase any additional equipment. This product from renowned Italian manufacturer, Annovi Reverberi, is the perfect all-rounder cleaning device. The pressure washer has been designed to be user-friendly and combines Italian design with practicality. This has resulted in a pressure washer that is durable, powerful, and versatile. The Blue Clean AR383 can be used on concrete walls and wooden furniture alike and is sure to appeal to the homeowner looking for an everyday cleaning tool. In addition to being a powerful cleaning tool, this option is also environmentally friendly. 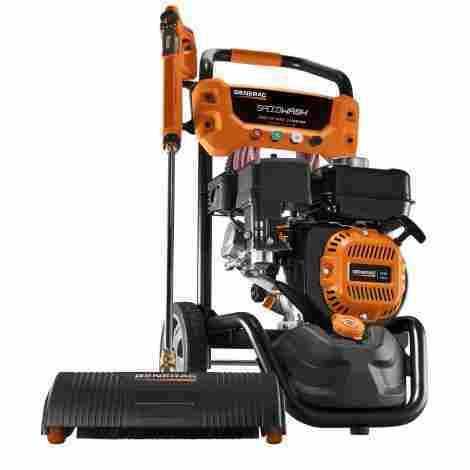 This pressure water has been designed to use up to 80% less water than other similar pressure washers thanks to its powerful engine. Every model comes with a variety of attachments, such as several different sized nozzles, and washer wands. The variety in attachments means that it will be easy for you to customize for an optimum cleaning experience. This product falls in the lower end of the spectrum compared to other products on the market. 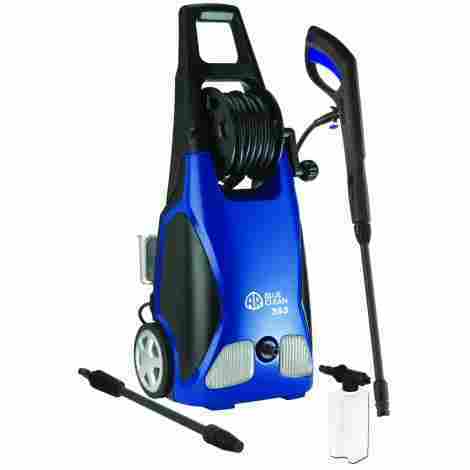 However, considering the product's durability and variety of attachments included, the Blue Clean AR383 offers incredible value for money. 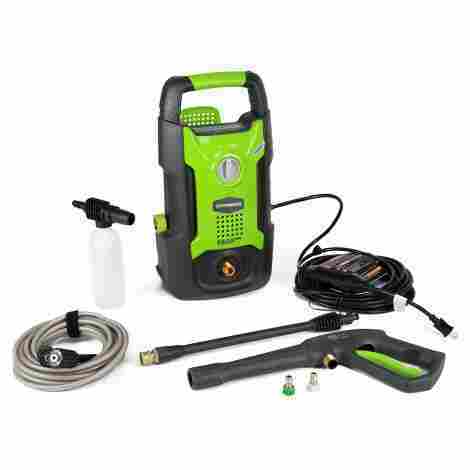 This uniquely designed pressure washer from German manufacturer Karcher is sure to appeal to those who have become frustrated with poorly designed electrical cords from their devices. This product features a unique four-wheel base that can easily follow you as you clean. The wheels itself are durable enough to manoeuvre over any surface. This is guaranteed to provide you with a hassle-free cleaning experience. 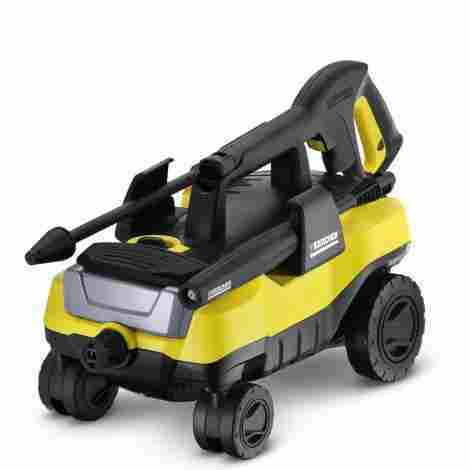 This is the only pressure washer on the market to feature a four-wheel base. The wheels are purposefully oversized for the device to move around easily as it follows you while you clean. Despite its innovative design, this product is incredibly reasonably priced. Every model comes with two separate cleaning wands and needs no other attachments. This device offers great value for money in addition to hassle-free cleaning. The power of this product definitely lies in its variety of cleaning attachments that allows you to clean faster and more effectively. This gas powered option packs a punch in power and effectiveness. The 196cc engine can deliver a pressure up to 3020 PSI which is ideal for even the most stubborn of surfaces, while the device's cleverly designed attachments allow you to clean up in record time. This device comes with the Power Broom. The power broom features several high-pressure nozzles that can blast away stubborn dirt in a single sweep. This attachment is ideal for cleaning up patios or driveways. Despite its intimidating power, the Generac SpeedWash has been designed with the user in mind and can easily be used by novice and expert cleaner alike. The device has impressive safety features, and other user-friendly controls to make cleaning quick and simple. This option is more expensive than other products, arguably due to its high power and quality attachments that come with the device. However, the Generac SpeedWash is an investment tool that was built to last and is ideal for commercial or residential cleaning. 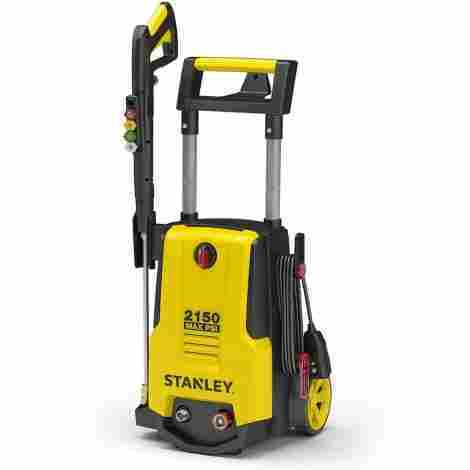 The trusted manufacturer Stanley has designed the ultimate in hybrid pressure washing. This device combines the power of gas-powered washers with the convenience of electric-powered washers. The result is a washer that easily delivers a pressure of up to 2050 PSI as well as a compact and user-friendly design. Moreover, this model features a list of impressive included attachments that will make cleaning more effective and faster. This feature is likely to appeal to automotive enthusiasts as it includes a foam cannon. This attachment will allow you to get the most out of your car wash soap. Simply spray your car with a thick and luxurious foam and watch as dirt and grime slide right off. More often than not, electric options simply cannot deliver the same amount of power as their gas-powered counterparts. This product proves that pressure washers can still be powerful without having to compromise on practicality and user-friendly design. This device is very reasonably priced considering its vast power. Furthermore, the device and all its attachment have been manufactured using only high-quality and durable materials. This device and all its attachments were built to last. PowRyte has been a trusted tool manufacturer for years and their pressure washer is a testament to this. This option is a powerful electric-powered device that features a unique induction motor capable of bringing you up to 2400 PSI. The device comes with several attachments and nozzles to suit any cleaning project. The PowRyte Elite's high pressure makes it perfect for residential and commercial cleaning alike. This is one of the few electric options that features an induction motor. This powerful motor includes thermal protection technology to increase its longevity. Moreover, the unique motor design delivers powerful water pressure for heavy duty cleaning. Each device includes 5 spray tips that use Quick-connect technology to make attachment easy and effective. This will enable you to easily switch between spray tips for an optimal cleaning experience. This product is somewhat more expensive than other pressure washers on the market. However, the device offers a PSI up to 2400, a two-year warranty and several high-quality accessories included in the price. The lightweight and compact design manages to be user-friendly yet powerful. This product is perfect for cleaning in and around your home as the device and its various accessories have been designed for powerful and diverse cleaning. This electrically powered washer offers up to 2200 PSI. Despite this power, the device was designed with simplicity in mind. 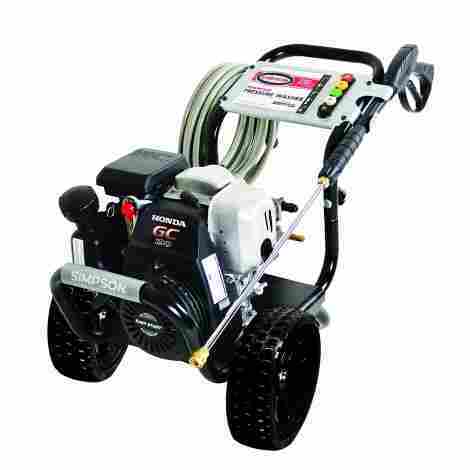 This is a great pressure washer for homeowners looking for quick and effective cleaning. This product uses a 1600-watt engine that can easily deliver up to 2200 PSI. This is ideal for deep cleaning on almost any surface and will allow you to easily and quickly remove dirt, grime, and even paint. This device prides itself on being user-friendly. You can assemble the device within a minute and be ready to use it immediately. In addition, the accessories are easy to attach and detach according to your needs. This makes the device perfect for novice cleaners. While this product is definitely not the cheapest one on the market, its worth the investment due to its high-powered pressure. In addition, each device comes with several different nozzles and other accessories for optimal, fuss-free cleaning. The PS3228-S from the trusted brand, Simpson Cleaning, uses a gas-powered engine to provide high-pressure cleaning. The PS3228-S is powered by a Honda engine that charges it to deliver a high water pressure of up to 3300 PSI. The device has been ergonomically and is easy and powerful enough to use both in residential or commercial properties. This product effortlessly delivers up to 3300 PSI which makes it ideal for home or industrial use. The high powered pressure will allow you to easily clean any kind of dirt, grime, paint, or any kind of build up with ease. This device includes several features such as a kink and abrasion resistant hose, thick never-flat tires, and durable fittings to withstand the test of time. This device is highly unlikely to be prone to frequent breakages and will help you clean for years to come. This product is one of the more expensive options available on the market. However, the device's durability and high-powered pressure make it the ideal investment piece for home or business owners who are looking for equipment that will last. While pressure washing may seem like an odious and necessary chore, using an effective pressure washer to periodically deep clean your house or car can be immensely beneficial. A pressure washer is able to clean surfaces on a level that is impossible to achieve with manual scrubbing. By using a pressure washer, you’ll be able to keep your home in tip-top shape and protect it from damage such as the growth of moss, algae, or mould. Moreover, a regular once over with a pressure washer can increase the value of your home and other objects. Pressure washing ensures clean and neat surfaces which will attract a higher price once you decide to sell your home. Lastly, pressure washing ensures that your home is more hygienic. Pressure washing blasts away dust build-up, mould, and other pieces of dirt and grime that could potentially aggravate the allergies of your loved ones. Modern technology has ensured that pressure washing does not have to be a chore. Most modern pressure washers feature an ergonomic and compact design that makes them easy to use while providing effective deep cleaning. Regardless, of your surface needs, our featured selection of the best pressure washers available on the market are likely to suit every need and budget. Your first step in choosing the perfect pressure washer should be to consider what kind of property you’ll be cleaning with your pressure washer. Do you require a simple device with moderate cleaning power to use around the home? Or perhaps you need a device with more cleaning power for commercial use. The environment you intend to use your pressure washer in should inform your decision in choosing your device. You should also consider the size of the property itself that you need to maintain. A homeowner who lives in the city with a small garden will perhaps require a more compact device with less cleaning power, compared to a suburban homeowner. Pressure washers are notorious for their high water consumption thanks to the high pressure at which the water is sprayed. While some don’t necessarily mind this factor, this could be a large consideration for the ecologically conscious or those who live in areas plagued by drought. Thanks to modern innovation, there are several pressure washers currently available on the market that use significantly less water while still allowing you to clean effectively. The average pressure washer can use up to 2 gallons of water per minute. However, this number can vary depending on the device’s specifications. To find a more water-wise option, look out for products that specifically state that they are environmentally friendly. If you’re still unsure, you can do some research online to ensure that your desired product is, in fact, conducive to conserving water. A pressure washer is powered using either gas (i.e. a combination of gasoline and oil) or electricity. Each device has its perks. An electric device does not require much attention to the upkeep and is generally easier to handle and store. Gas pressure washers, on the other hand, offer much more cleaning power and a higher PSI and are not bound by an electrical cord. However, they are rather bulky and require much more attention to its upkeep. Pounds per Square Inch (PSI) is the term used to measure water pressure. Generally speaking, a pressure washer can offer a PSI starting from about 1000 PSI to up to 3500 PSI, with certain commercial pressure washers offering even higher pressure. The maximum amount of PSI that you require will ultimately depend on what you intend to use your pressure washer for. Someone who simply wants to use their washer to perform simple cleaning tasks will require a much lower PSI than users who are looking to use their washers for industrial cleaning. Each pressure washer will also offer a variety of pressure settings. While a washer may advertise a PSI of up to 3500, for example, the device itself will have the means to switch to lower pressures for milder cleaning. The size of a pressure washer is an important consideration for two reasons. First of all, you need to consider whether you have enough space to safely store your washer. Secondly, you need to consider the strength and capability of the individual who will be using the pressure washer the most. Pressure washers can be somewhat bulky which often causes problems when it comes to storage and handling. While the market has seen the emergence of more compact and user-friendly devices, in recent years, this should remain a top consideration when choosing your pressure washer. Apartment dwellers and senior individuals might prefer a more lightweight and compact design, even if it means compromising on cleaning power. In contrast, business owners or those with a large property might prefer bulky and heavier washers to benefit from its cleaning power. The surfaces you intend to clean with your pressure washer should play a major part in your decision making. Especially since there are several washers that were designed for a specific surface or purpose. For simple general cleaning, you cannot go wrong with a general pressure washer that offers you an average PSI of about 1500 to 2000. However, if you’d like to use your pressure washer for more purposes, such as stripping paint, you should consider a washer that offers higher pressure. The same goes for heavy-duty or industrial cleaning. You should also look out for any additional accessories that some washers may offer that may be more suited to your needs. For example, some washer may offer an added soap applicator or foam cannon that is ideal for washing your car. The majority of available pressure washers include several attachments such as hose and nozzles or spray tips in the box. You should take care to ensure that these accessories are of a durable material and that they are easily replaceable in the event of breakage. 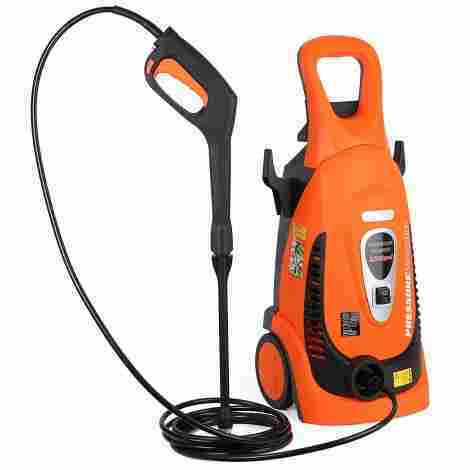 You should also consider whether your pressure washer is compatible with universal accessories and attachments. This will make replacing parts and attachments much easier. Not everyone is technical minded and this might pose a problem when it comes to assembling some pressure washers. Almost all pressure washers need to be assembled when you buy them and depending on your skill level and prior knowledge of pressure washers, you should consider how easy this assembly process will be. Your pressure washer will come with an instruction manual. However, it is still worth considering how much labour and skill will be involved in assembling your washer. Devices intended for home use are generally easier to assemble than their commercial counterparts. Similarly, electric washers are often easier to assemble than gas-powered washers. This is an important consideration as it will guide you as to how powerful your pressure washer needs to be. For example, the user who lives in a dry area will be more concerned about getting rid of superficial dust and sand, while the user who lives in a humid and rainy area will be concerned over getting rid of mildew. In addition, those who live in dry areas might be more concerned about preserving water than the user who has ample access to water. Q: What is a pressure washer? A pressure washer is essentially a device that empowers you to perform heavy-duty cleaning using water that is sprayed forth at a very high pressure. This device uses water from a hose pipe, and an internal motor to emit water from the cleaning attachment at a pressure determined by the user. This allows the user to blast away all forms of dirt, sand, grime, and can even be used to strip away paint. Q: What can I use it for? A pressure washer has a variety of uses from cleaning to DIY. Using a pressure washer you will be able to clean almost any surface in and around your home or business, such as walls, doors, patios, driveways, exterior furniture, cars, boats, motorcycles, fences, gutters, parking lots, and sidewalks to just name a few. In addition, a pressure washer can be used for DIY projects such as stripping paint from surfaces before repainting. This would largely depend on the brand and model number you choose to buy. Generally speaking, gas-powered pressure washers are somewhat more difficult to assemble than electric pressure washers. If you are apprehensive about assembling the pressure washer, you can speak to a salesperson to inquire about the assembly process before buying or read reviews of the product online to find out more about how technical the assembly process is. Q: Where do I get the water from? The pressure washer uses water that is taken in from the device’s water inlet. You simply attach the included hose to your device’s water inlet and secure that to the nearest water source, I.e. your nearest water tap. If you don’t have any water taps available, you can also secure the hose to an alternative source of water, such as a large water tank. Some devices also come equipped with portable water tanks. Q: Why does it have different pressure settings? Most pressure washers offer the user the choice between different pressure settings for their own convenience. A variety of pressure settings offers the user optimal cleaning versatility. For example, while your pressure washer may boast a PSI of up to 3500, this pressure would be entirely too much for wooden surfaces. Different pressure settings are optimal for different surfaces. Your device’s instruction manual should be able to guide you through the best pressure for every individual surface. Most pressure washers will include a hose that you can attach to the device’s water inlet. However, the exact length of the hose will largely depend on the manufacturer. Generally speaking, you can expect the included hose to be anything between 20 and 25 feet. Q: What is the difference between electric and gas models? Gas and electric refers to the means by which pressure washers are powered. Electric powered pressure washers use electricity. You can simply plug in your device at the nearest electrical socket, or use an extension cord, and continue with your cleaning. 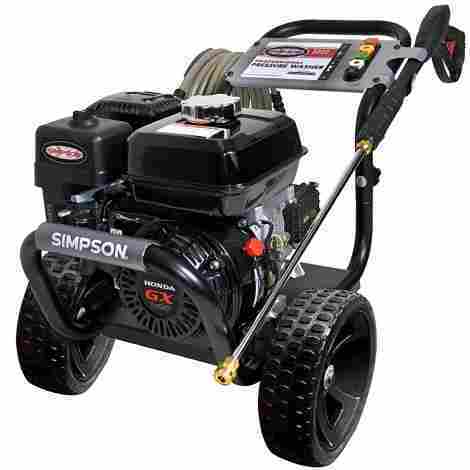 Gas powered pressure washers use a mixture of gasoline and oil to work. Your device’s instruction manual will give you detailed instructions as to which oil and gasoline you should use and where you should insert these. Q: How much oil and gasoline does a gas powered model use? Once again this will depend on the brand and model you’ve purchased as well as the kind of engine that your device uses. Most major manufacturers recommend that you replace your device’s oil after the first five hours of use, and after that replace the oil after every 50 hours. As for gasoline, most manufacturers report that their devices use between 0.85-0.96 gallons of fuel per hour. However, your device’s exact fuel consumption should be stated in your instruction manual as well as which fuel you should use. Q: Can I use soap with a pressure water? Yes, you can! Using soap could make cleaning an even quicker process and can go a long way in preserving the surfaces that you clean. Many pressure washers offer a variety of innovative attachments to make adding soap to your cleaning much easier, such as detergent tanks, soap applicators and even foam cannons. Q: What kind of soap should I use? If possible try to use a soap that was created by the same manufacturer as your device itself. Always try to use gentle, non-abrasive soaps that are biodegradable. Q: Is it safe to use on wooden furniture? Yes, it is, a pressure washer can be used on wooden furniture and wooden patios as long as it is used at a gentle pressure and with a soap that is specially formulated for wooden surfaces. Q: What temperature should the water be? Almost all devices will require cold water. Once again, this depends on your specific device. Pressure washers do have the reputation of being quite noisy. However, newer models are seeking to make devices quiet. Generally speaking, a gas-powered washer is noisier than an electric-powered washer. For those who don’t want to aggravate neighbours or frighten small pets or children, it might be worth looking for electric-powered devices. Q: How do I replace broken parts? If your device is broken or a specific part is not working, your first step should always be to contact the manufacturer’s customer service to troubleshoot your problem. If this cannot address your issue, your manufacturer may offer to fix your device, provided that it is still under warranty. If your device is no longer under warranty, you should ensure that all replacement parts are from the same manufacturer to prevent wrecking more damage to the device. Q: What additional fittings can I use on my pressure washer? While most pressure washers do come with a variety of attachments and fittings, these may not always suit your cleaning needs. If you require any additional attachments, such as a specific hose or nozzle, try to buy this device from the same manufacturer, if this is impossible, try to purchase brands that are endorsed by your device’s manufacturer. Be wary of attachments that claim to be universal, as this is not always the case.